Bede Griffiths (1906-1993) was described by the late Cardinal Basil Hume as a ‘mystic in touch with absolute love and beauty’. He was a Benedictine monk in England for many years and later went to live in India where he become well known for his integration of western Christianity with the wisdom of the East. Bede Griffiths spent many years has a Benedictine monk in England and Scotland. 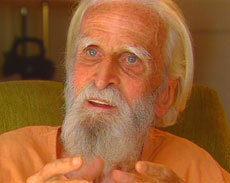 In 1955 he travelled to India to ‘find the other half of my soul’. His quest was to explore the depths of the Christian experience from the understanding of Indian spirituality and to establish a monastic way of life according to the customs of the Indian ashram. For many years he lived at Shantivanam Ashram in Southern India, where people from all over the world came to hear him teach and to be in the presence of a mystic whose loving presence transformed many lives. The Bede Griffiths Trust (www.bedegriffiths.com) was established in America by Father Bede before his death. The Trust has a particular responsibility for the literary estate of Father Bede, and is active in promoting his vision of the renewal of contemplative life in the west. The Bede Griffiths Sangha (www.bedegriffithssangha.org.uk) was established in the UK as a network of interested individuals inspired by the life and vision of Father Bede. It holds regular retreats and seminars and published a quarterly newsletter. Saccidananda Ashram (Shantivanam) (www.camaldolese.com and www.camaldoli.it) was one of the first Catholic ashrams in India which had at its heart the integration of the ancient spiritual wisdom of India into Christian life. It was founded in 1952 and the ashram is now affiliated to the Camaldolese congregation, an order of contemplative monks with houses in Europe, the United States, India, Africa and South America.